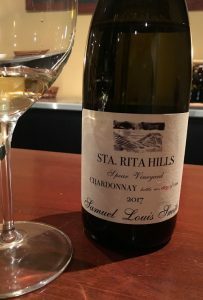 2017 Samuel Louis Smith, Chardonnay, Spear Vineyard, Sta. Rita Hills. Sam Smith’s gorgeous Spear Chardonnay is a revelation in California Chardonnay for this vintage, it rides the line between restraint and opulence to perfection with an exotic nose, smooth layers as well as lifted vibrancy, striking detail and precision. Smith who is from the Santa Barbara area, and having worked there, knows where great grapes are in the region, and this brilliant wine shows this knowledge in its full scope as well as his judgement and talents in the cellar. He is Morgan Winery’s head winemaker, and in recent vintages raised the game there, making some of the best Pinots and Chards ever made by this famous Monterey label. Sam Smith’s own label, Samuel Louis Smith wines is all about handcrafted quality, all very small batch stuff mostly from single (Cru) sites in the Central Coast, from Santa Barbara County to the Santa Cruz Mountains, focused on Pinot Noir, Syrah and Chardonnay(s) like this one. I’ve been lucky enough to have had a few vintages of Smith’s wines, each one I’ve tried has impressed me with balance, texture and depth, especially his 2017’s, which are some of the most interesting and seductive I’ve tried from this year. Spear is a vineyard in the northwestern zone of Sea. Rita Hills, it is really an under the radar site that is coming into its own, I have had a few Chardonnays from this north facing (cool climate) hillside and clay soil site in recent years, again all of which, while diverse in styles showed huge potential, including Sam’s here as well as Greg Brewer’s Diatom and the estate wines crafted at Spear. According to Spear, these are amongst the highest elevation plantings in the famed appellation. Peaking at 900’ above sea level, there are currently 34 acres in production representing six different grape varietals on a multitude of diverse clonal, rootstock, orientation, elevation and soil combinations. With the Chardonnay plots being planted to clones: 4, 95, 96, Wente & Mount Eden, all farmed certified organic with, as the grower puts it, viticultural practices obviate the use of inorganic fertilizers, pesticides or herbicides. Spear is owned by Ofer Shepher, who also owns the famous Gnesa Vineyard, and he has truly been inspired by the Santa Rita Hills and is dedicated to growing the best grapes in the region and as he puts it, have wines (made from his grapes) taste like where it came from, and Sam’s Spear certainly does that! The Samuel Louis Smith 2017 Spear Vineyard Chardonnay is on the level of some of the best in the state, this vintage has the qualities you’d find in wines like Rhys, Ceritas, Arnot-Roberts, Brewer-Clifton, Sandhi and Littorai to name a few, it shows fantastic definition and length, this is great stuff and a superb value, the quality to price ratio is exceptional, it is a wine that reflects the best in California. The Spear Chardonnay, ripe and full on the palate, but with nice acidity, it weaves complexity from start to finish, all the while having the finesse that Burgundy fans would appreciate. Smith, who credits the place for the quality here with soils of both sedimentary clay loam and white beach sand make it a rarity in the appellation, used native yeasts, starting in stainless, but finishing both primary and partial malos (85%) in barrel, 55% second fill Francois Freres barriques with a nine month elevage, finishing with a refreshing 12.5% natural alcohol, then bottled unfined and unfiltered. The result is glorious with bright citrus, honeysuckle and a touch of tropical fruit, with the clay soils allowing an impression of density without being heavy, it shows serious palate impact with classic peach, apple and pear fruit at it’s core and a touch of mineral, smoky/toast, butterscotch and wet stones. Already drinking well, this pale golden wine should age nicely too, though I can hardly imagine a reason to wait, and it should provide lots of joy with sea food and or poultry, in particular fleshy white fish, crab, lobster and shellfish or soft cheeses.